Complete with multi-surface cleaning formula, storage tray and an additional roller, free up over-filled cupboards and busy schedules with the help of this compact all-in-one cleaner. 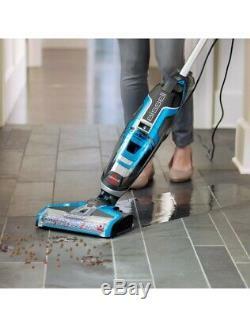 Smart design - a 2017 Red Dot award winner, this fantastic cleaner boasts numerous features. From SmartClean Fingertip controls on the handle that enable you to change between rug and hard floor settings as you glide across different surfaces, to swivel steering that allows you to manoeuvre more easily under furniture and reach into tight corners, every detail is designed to make your cleaning process even easier. Hard floor hero - dropped a raw egg on your kitchen floor? When it comes to hard floors, the Crosswave washes to a remarkable standard and its brush-roll and multi-surface formula powers through stains and sticky messes for a thorough, streak-free result. Use it on everything from tiles and sealed wooden floors, to laminate, lino or vinyl. Revitalise rugs - with the included multi-surface cleaner, you also have the ability to inject a solution of warm water directly into the fibres with this innovative device. 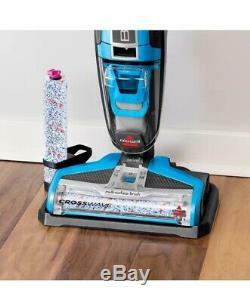 In addition, the attached rotating brush roll rotates at 3,000 RPM, working to dislodge and remove dirt at the same time to leave rugs looking fresh and revitalised. Perfect for pet owners - the simplicity and ease of this product makes it a great cleaning solution for effortlessly picking up and washing away dirty paw prints and food trails. 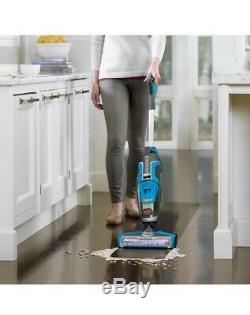 In addition, a busy family home can often lead to lots of little spills, which can be quickly solved with the vacuum function. All immaculate and in perfect working order. 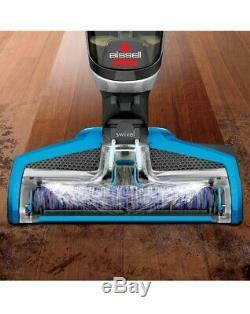 The item "Bissell 1713 CrossWave All in One Wet & Dry Cleaner Blue / Grey" is in sale since Saturday, April 6, 2019. This item is in the category "Home, Furniture & DIY\Appliances\Ironing & Vacuuming\Vacuum Cleaners". The seller is "nice1nelly" and is located in St.